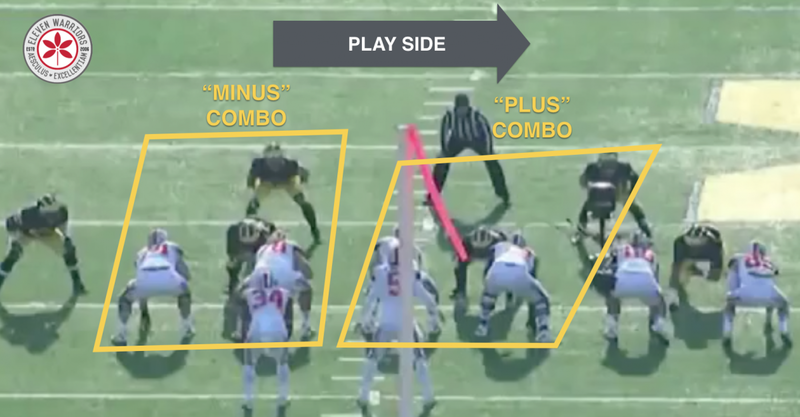 After looking at the basic schemes and the techniques used to execute them, the third and final installment of our look at the Tight (Inside) Zone will explore the most complicated concept of the play - combination blocks - and how they are the lynchpin of everything else that happens around them. 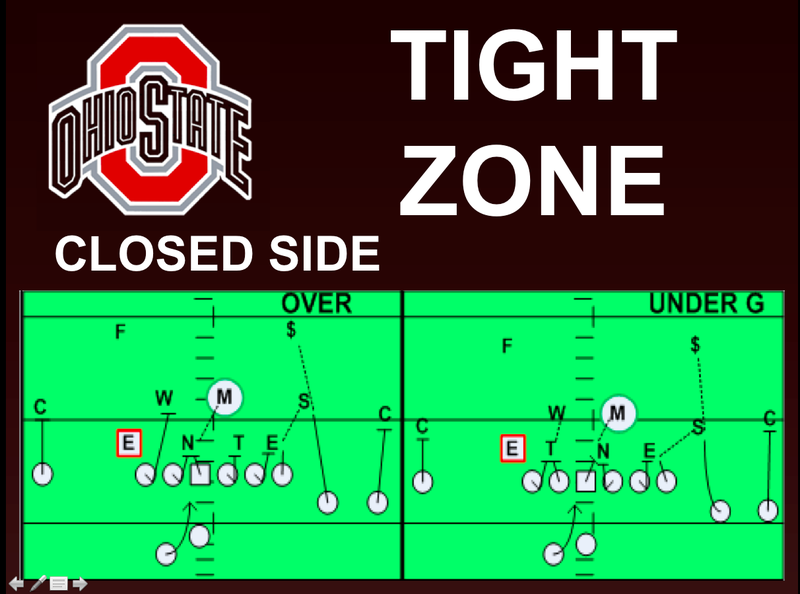 As we discussed in part 2, offensive linemen in the Tight Zone scheme must identify if they are covered or uncovered before the ball is snapped. While the immediate reason is to identify what kind of footwork to use, it's also a clue for how the man next to them will block. 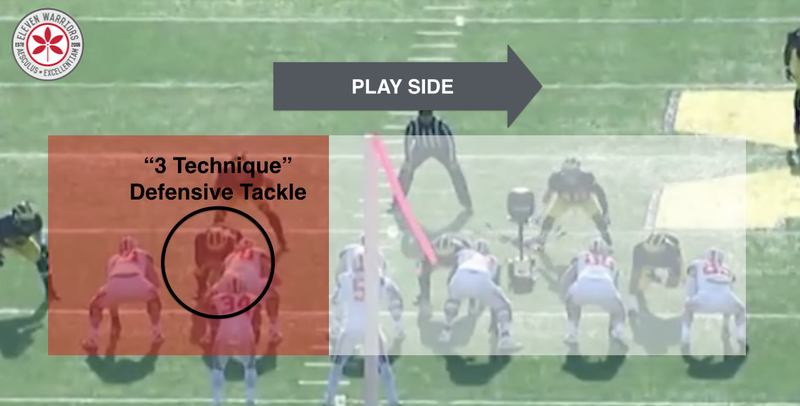 Given the location of the 3 technique Defensive Tackle on the left side (creating an "Under" front), the guard and tackle to that side know they'll be blocking him in a combination, while the Center will work with the Right Guard to double team the opposite side nose tackle. Additionally, knowing that the 3 technique is to the left (Red) side, the aiming point for the Running Back has shifted to the natural gap between the Center and the Left Guard. He'll look for a hole there, even though the play is effectively being blocked to the right. 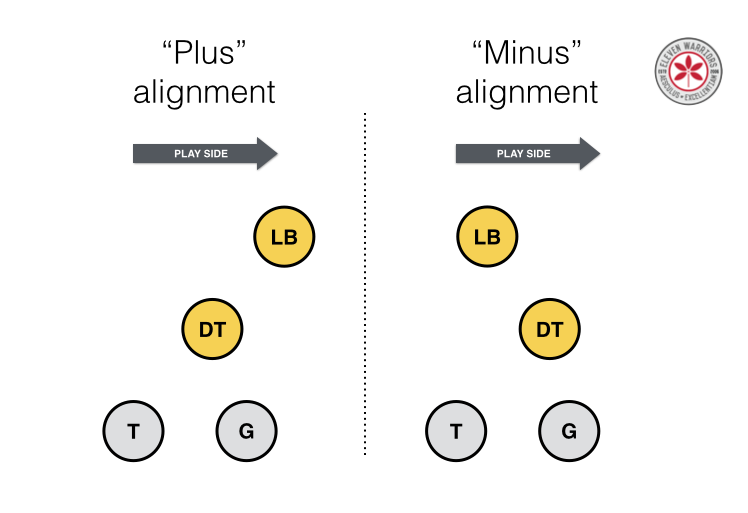 If the second level defender is lined up on the play side of the defensive linemen in front of him, he is considered to be in a "Plus" alignment. If he is lined up away from the play side of the defensive linemen, then he's considered to be in a "Minus" alignment. The reason for the wording has to do with the steps of the offensive line. Since, in this instance, their first step will be to the right, their momentum will naturally take them downhill to the second level player if he's in a "Plus" alignment. However, given that these defenders are usually responsible for defending one of the gaps between offensive linemen, they will move after the snap. The offensive line must first be prepared to face the movements of the first level defender, giving life to the mantra of nearly every offensive line coach: M.T.F.G.F or "Move The Fat Guy First." No matter what, both offensive linemen must address the defensive tackle first and foremost before moving onto the second level player. Once one player has control of the defensive tackle though, the other can move on to the linebacker. On the left side of the line, we see the Defensive Tackle trying to split the Guard and Tackle, with the Linebacker behind him moving toward the hole to the right of #78, Andrew Norwell. Even though he's engaged with the DT, Norwell keeps his eyes up, as he knows he has help coming from #74, Jack Mewhort. As the Linebacker starts flowing inside of him, Norwell comes off his combo block with Mewhort and takes on the Linebacker, sealing off the hole to his side for the runner. On the right side, the Defensive Tackle has immediately slanted away from the ball, trying to split the gap between the Right Guard, Marcus Hall, and the Right Tackle #68, Taylor Decker. Knowing that the aiming point for the runner is on the opposite side, Hall allows the defender to work himself out from the play, simply by keeping close contact and letting his opponent do the work. 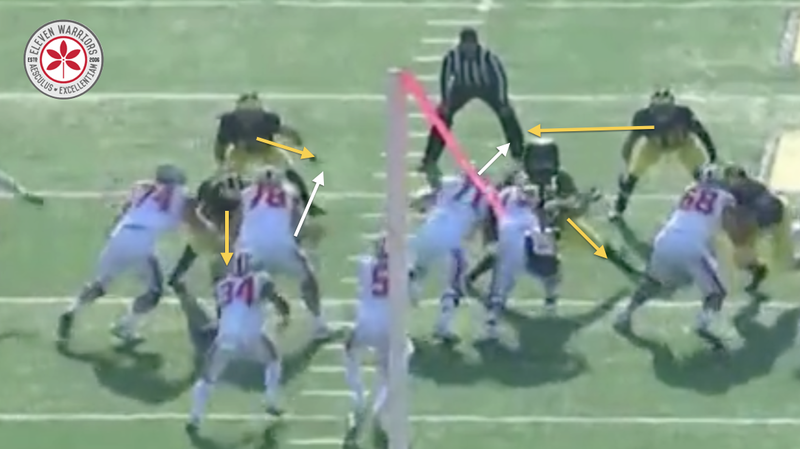 The Center, Corey Linsley, does his part of the combination block by immediately getting a hand on the defensive tackle, but since he's slanting away, Linsley's eyes downfield allow him to see the Linebacker coming his way. This all happens in an instant, as Linsley works quickly to take on the Linebacker. Without the key blocks at the second level from Norwell and Linsley, this Tight Zone play maybe nets the Buckeyes only two or three yards. But by identifying the alignment of the defense, using great technique, and most importantly working together to ensure every defender is blocked, the Buckeyes wound up with an 18 yard gain. Pretty good for a simple run up the middle, isn't it?